This song is a canon, or it can be sang in a round, so to speak. 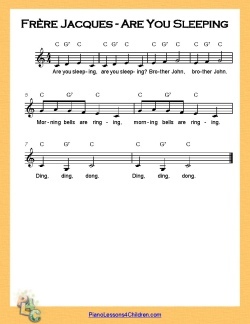 The first person starts singing the words from the beginning (Are you sleeping), and after he gets to the second set of words (Brother John), then another person starts singing from the beginning. Then, when the first person is in the third sets of words (morning bells are ringing), another person starts singing from the beginning, and so on. 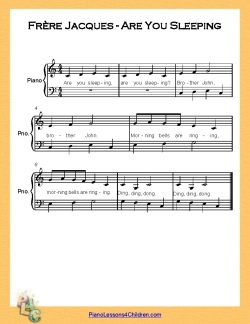 Sing along Frère Jacques (Are You Sleeping), both in French and in English, with The Wiggles. This video shows how the song sounds when sung in a canon, this time for two voices only. Here's a simple animated YouTube video for kids that has Brother Bear and little John. Sing along! Click the images below to open and print the "Frère Jacques (Are You Sleeping)" free sheet music. Right click and choose "Save link as" to download the PDF files to your computer. See a beginner piano lesson for Frère Jacques (Are You Sleeping)!